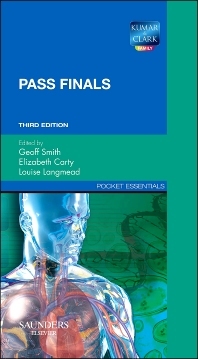 Pass Finals is a notes-style summary of the key facts to know for the diagnosis and management of important diseases. The book relates to Kumar & Clark's Clinical Medicine, and it's synoptic approach is intended to help time-poor students with revision for final exams in medicine. Information is presented as bullet point lists and short summaries. There are also practice self-assessment questions at the end of each chapter, with explanatory answers at the end of the book. 1 How to pass medical finals. 2 Question types in medical finals. 3 Objective Structured Clinical Examinations (OSCEs). 16 Oncology and genetic disease. 19 Statistics and evidence-based medicine. Appendix A. Answers to multiple choice questions. Appendix B. Answers to extended matching questions. Appendix C. Normal reference ranges / Normal values for laboratory tests.